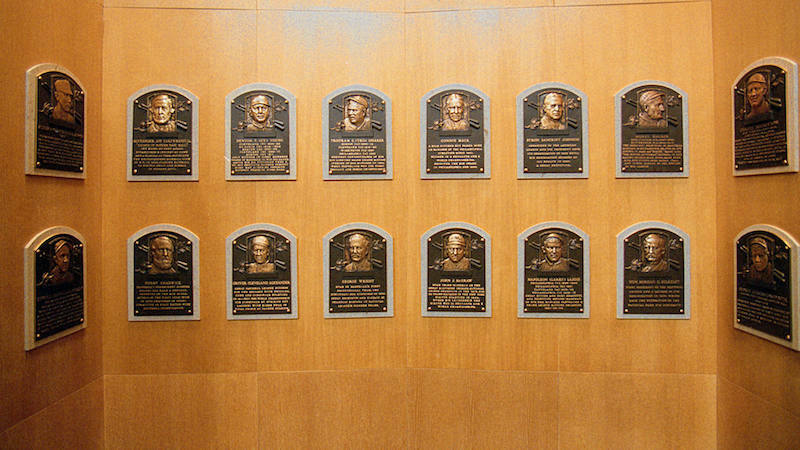 Ken Griffey, Jr. and Mike Piazza will have their Hall of Fame plaques added to the immortals on Sunday. This Sunday, Ken Griffey, Jr. and Mike Piazza will be inducted into the National Baseball Hall of Fame in Cooperstown, N.Y. Chris Jordan (Griffey) and I (Piazza) took a look back at two of the greatest stars the game has ever seen. Two baseball icons of the 1990s, set to join the greatest of the great. George Kenneth Griffey Jr, better known as just “Ken”, “The Kid”, or “Junior”, was voted into the Baseball Hall of Fame with a record 99.32% of the vote this year. He is the son of former big leaguer Ken Griffey Sr., who is now the least-famous Ken Griffey in history. 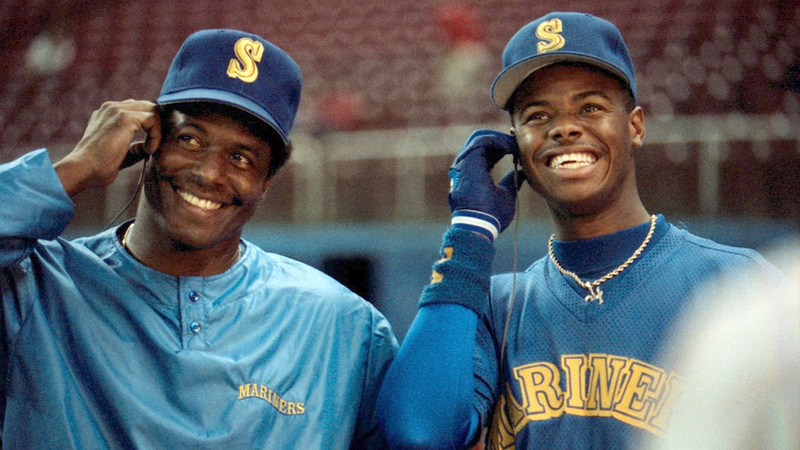 The Griffeys, the first father-son duo to play as teammates in MLB history. Listening to Jock Jamz. Probably. 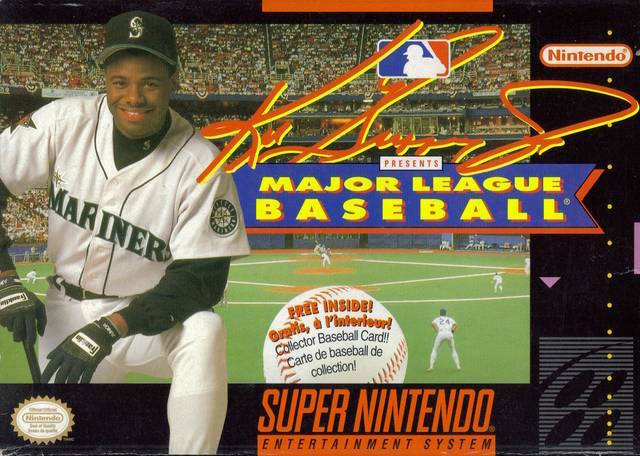 Ken Griffey, Jr. was the face of baseball during the 90’s, and the idol of hundreds of current MLB players (and fans) who grew up during that time. When his name came up on the Hall of Fame ballot, it was not a question of whether he would get in, but whether he would be unanimous. His 99.32 vote percentage is the highest total received by any player in history, beating Tom Seaver’s 98.84 percentage in 1992. Junior, arguably the second-best left-handed-hitting outfielder born in Donora, Pennsylvania*, was selected first overall in the 1987 amateur draft by the Seattle Mariners. He made his major league debut on April 3, 1989 against the Oakland Athletics and his first MLB hit was a double off then-ace Dave Stewart. One week later, Junior Griffey hit his first major league home run at the old Kingdome in Seattle off the White Sox’s Eric King. *This is the other guy. You decide who was better. A .284 batting average, 2,781 hits, 630 home runs, 1,836 runs batted in, a thirteen-time All-Star, the 1997 American League MVP, a ten-time Gold Glove Award winner, seven-time Silver Slugger Award winner, All-Star Game MVP in 1992, National League Comeback Player of the Year in 2005, and a three-time Home Run Derby champ (1994, 1998, and 1999). Unfortunately, Junior never won a World Series ring during his career, which is really the only piece of hardware missing. One of the sweetest swings of all time, Griffey swatted 630 home runs. The ten straight Gold Gloves indicate Junior was not just about the long ball. His defense was stellar, as several of his grabs have made “all-time great” highlight reels. Junior was one of those players that transcended the sport and was a household name, accomplishing such things as appearing on a box of Wheaties, commercials for Nike, and even had a video game with his name stamped on it. Griffey should be in the Hall just for this. I spent years playing it. Griffeys (Griffies?) Junior and Senior became the first father-son combo to play on the same team at the same time during the 1990 and 1991 seasons. The duo hit back-to-back home runs on September 14, 1990 against the Angels, another first. Another memorable Junior moment occurred during Game 5 of the 1995 American League Division Series, with the Mariners facing the dreaded (and favored) New York Yankees with the season on the line. The must-win game went to the 11th inning, with Junior on first base when Edgar Martinez laser-beamed a double down the left-field line. After Joey Cora easily came in from third to tie the game 5-5, Griffey raced home with the winning run, setting up a memorable scene where the entire team ran out of the dugout to dogpile him as he scored. * In the AL Championship Series, Seattle got unfortunately bounced in six games by the 100-win juggernaut Cleveland Indians. *In Seattle, this play is simply known as “The Double” and it essentially saved baseball in the state of Washington, as poor attendance for years had the M’s considering relocation. 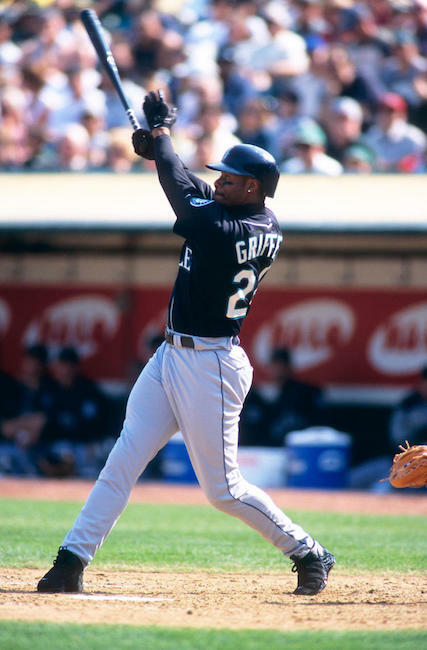 Griffey won the AL MVP award in 1997, after helping the Mariners to the postseason yet again. That year he posted a .304 batting average with 56 home runs and 147 RBIs. This, of course, was during the “Steroid Era” of baseball, where offensive numbers were severely inflated. While many players were eventually singled out for their alleged cheating, none of that speculation was ever pointed Junior’s way. Helping his cause was the fact that he steadily produced solid numbers from the beginning of his career, before such speculation was even hinted at. 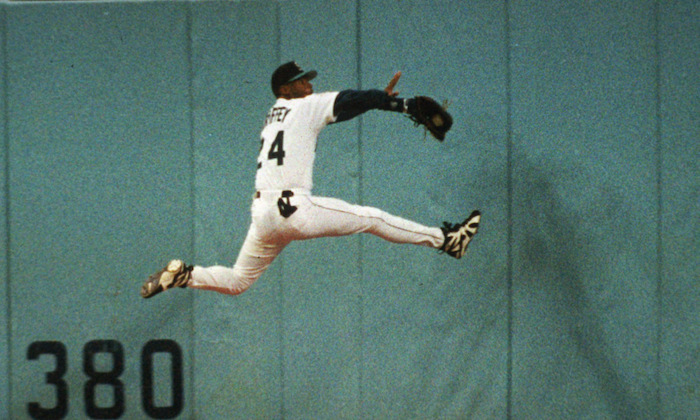 Just one of Griffey’s amazing catches that helped him net 10 Gold Glove Awards. Griffey was traded to the Cincinnati Reds on February 10, 2000, as he had expressed a desire to be closer to his young family and help raise his kids. Griffey’s numbers in Cincinnati never did reach those of his Mariners’ peak, as recurring injuries sidetracked him time and again. He bounced back in the 2005 season, however, earning the NL Comeback Player of the Year award, launching 35 homers with 92 RBIs. This never looked right. Sort of like that second Darrin Stevens on “Bewitched”. Or Jon Lovitz on Newsradio. 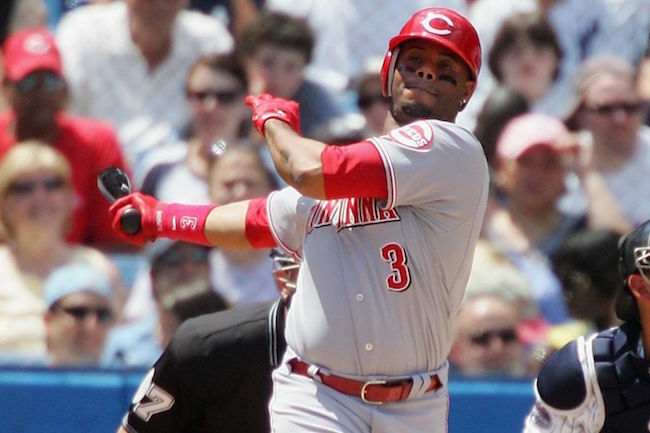 The Reds would trade Junior to the Chicago White Sox on July 31, 2008, where he played just 41 games. In 2009, at age 39, Griffey returned to the Mariners. He wrapped his career over two partial seasons with Seattle, hitting .208 with 19 homers over his final 150 games. The smile that won over the entire Pacific Northwest. 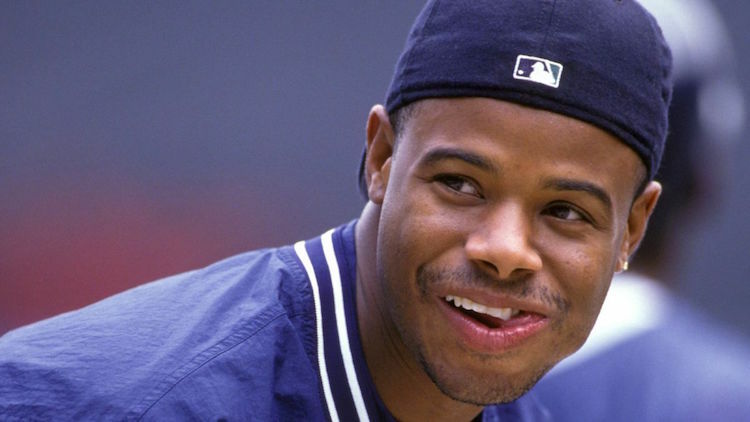 With his backwards cap and ever-present grin, for many of us, Ken Griffey, Jr. was the game of baseball. This Sunday, he takes his rightful place among the greats. 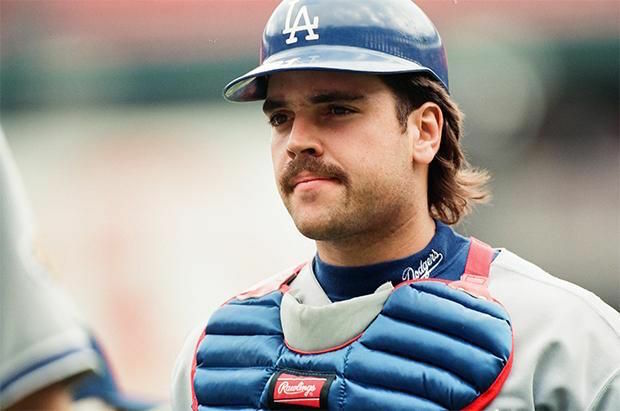 Mike Piazza, rocking the Dodger-stache. 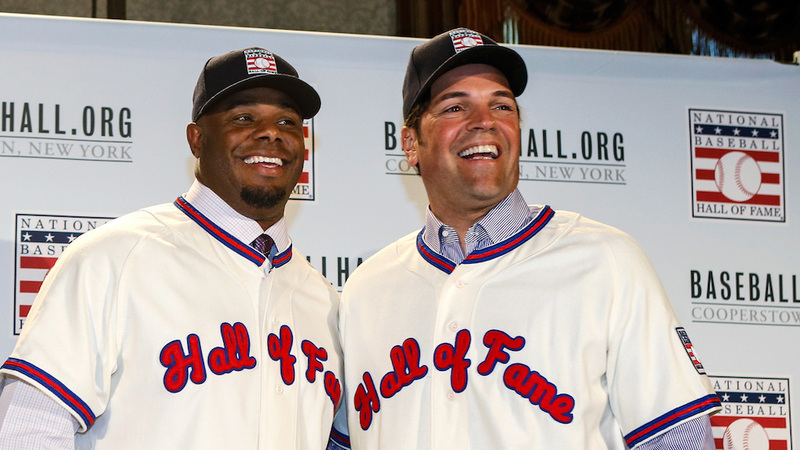 Mike Piazza, along with fellow 2016 Hall of Fame inductee Ken Griffey, Jr., will make for a most historic Cooperstown induction this Sunday. Griffey, who will be the first player inducted as a Seattle Mariner, was a number one-overall draft pick, the top selection in the 1987 Major League Baseball draft. Shockingly, the man known to millions of 90s baseball fans simply as “Junior” is the first No. 1 pick to make the Hall of Fame. Piazza, on the other hand, will make history as the lowest-ever drafted player to be inducted. He was taken by the Los Angeles Dodgers in the 62nd round, the 1,390th player chosen. Fifth from the final pick in the 1988 draft, selected in-between such legendary trivia answers as Al Bacosa (1389th by the Braves, FYI) and Jim Greenlee (1391st by the Astros). Mike Piazza was drafted due to a fortunate family connection. 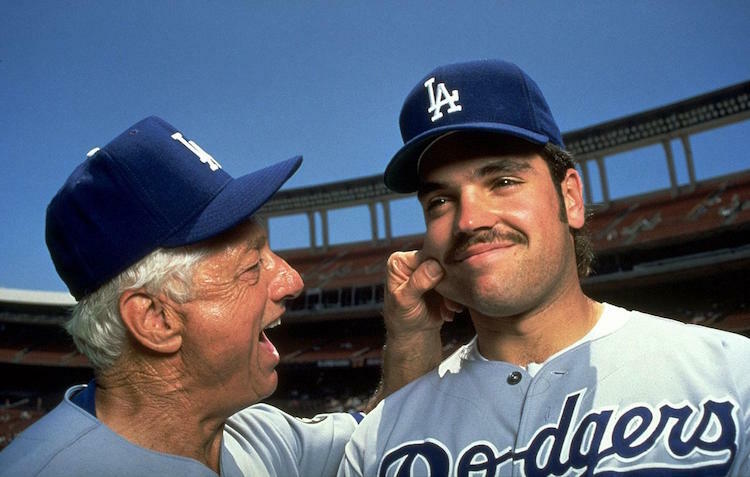 His father, self-made millionaire Vince Piazza, was a longtime friend of then-Dodgers manager Tommy Lasorda. They grew up in Norristown, Pennsylvania together, just outside of Philadelphia, and Lasorda was the godfather (and namesake) of one of Mike’s younger brothers. “Who could say no to drafting this face?” — Tommy Lasorda, probably. The greatest hitting catcher of all-time was the result of a family favor. Michael Joseph Piazza would go on to become, without question, the greatest hitting catcher of all time. While the catcher position is traditionally viewed as a defense-first spot where weak hitting is acceptable, Piazza’s numbers would rank him among the best at any position. Among backstops, Piazza sits first in home runs (427 total, 396 solely as a catcher), slugging percentage (.545), and in OPS (.922), third all-time in career batting average (.308), fourth in RBIs (1,335), fifth in on-base percentage (.377), seventh in hits (2,127) and runs scored (1,048), 13th in walks (759), and 18th in games played (1,912). Truly elite totals anywhere on the diamond. Dude was a pretty great hitter. *Strangely, the player right below Piazza (726) in games caught for the Dodgers is Bill Bergen (713), one of the worst hitters to ever sustain a Major League career. Bergen, who played for the Brooklyn Dodgers from 1904 until 1911, hit .162/.184/.187 during his time in blue. His brother, Marty Bergen, is infamous for committing these horrific acts in 1900. In the midst of his 1998 campaign and on the verge of free agency, Piazza wound up in a bizarre series of transactions that saw him traded twice in eight days. 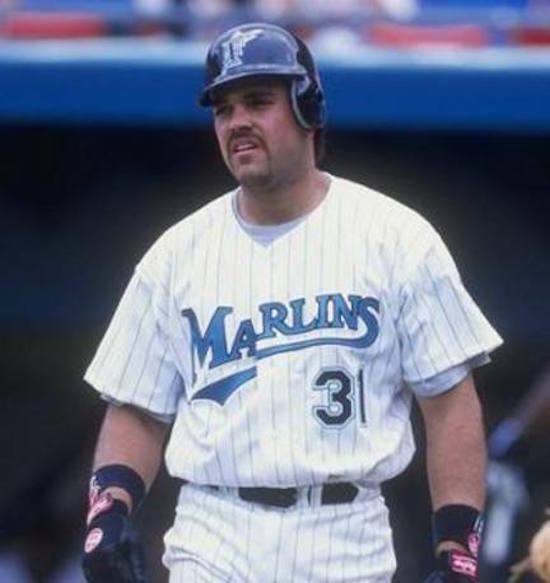 The slugger had developed an acrimonious relationship with the Dodgers’ FOX-affiliated ownership group which resulted in a baffling deal to the then-Florida Marlins, along with third baseman Todd Zeile for a unique return from the Fish, who were unloading anything not nailed down after their 1997 World Series win over Cleveland. While the L.A. return package of veterans Bobby Bonilla, Gary Sheffield, Charles Johnson, Jim Eisenreich, and young pitcher Manuel Barrios qualified this deal as a blockbuster for both sides, Piazza’s next move only really worked out on one end. After eight days with the teal-and-black attack that was the Marlins, Piazza was dealt again to the New York Mets for Preston Wilson, Ed Yarnell, and Geoff Goetz. Mike went on to bash 220 home runs for the Mets, including a memorable 8th-inning blast in Shea Stadium’s first post-9/11 game off Atlanta reliever Steve Karsay on September 21, 2011. The home run put the Mets up 3-2 and gave the entire city a healing breath of normalcy. 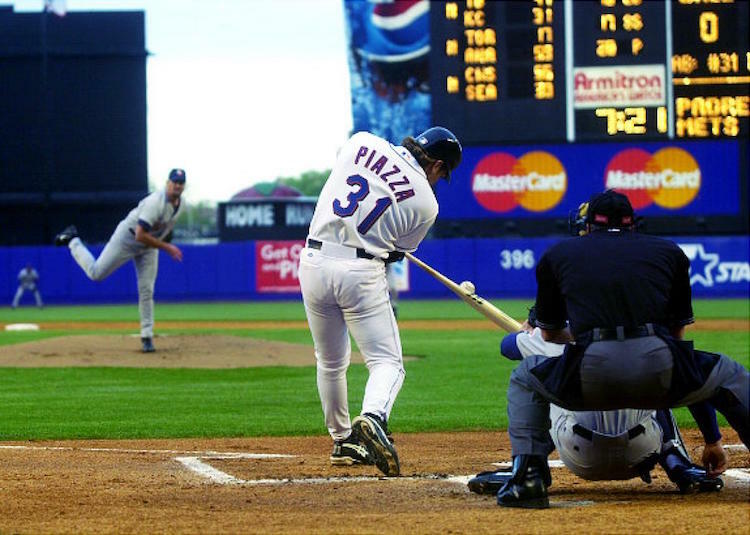 While Piazza never won a World Series ring, he was in the postseason several times, including two National League Division Series with the Dodgers, two NLDS with the Mets, one NLDS with the San Diego Padres, and one National League Championship Series in 2000 with the Mets. In his lone World Series, the 2000 “Subway Series” against the New York Yankees, Piazza hit .273 with two doubles and two home runs. 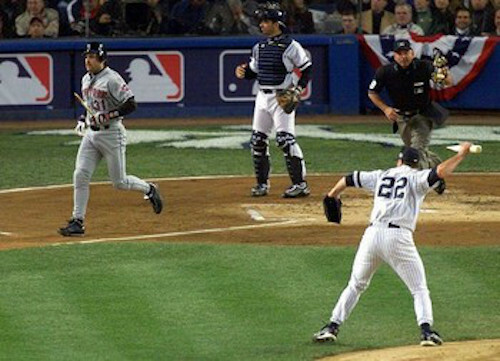 His most famous moment in that Fall Classic, however, was when Yankees’ ace Roger Clemens tossed a broken piece of bat in Piazza’s direction as the slugger ran toward first base. Clemens claimed he thought it was the ball that he was tossing (toward the ground), while the benches cleared. Yes, Roger, a ball is wooden and pointy. Piazza got his “revenge” during the 2004 All-Star Game, when he was the starting catcher for the National League and Clemens — now with Houston — started the game and allowed six runs in the first inning to the American League batters. In 2006, Piazza left the Mets and signed on the Padres, hitting a respectable .283/.342/.501 in 126 games. 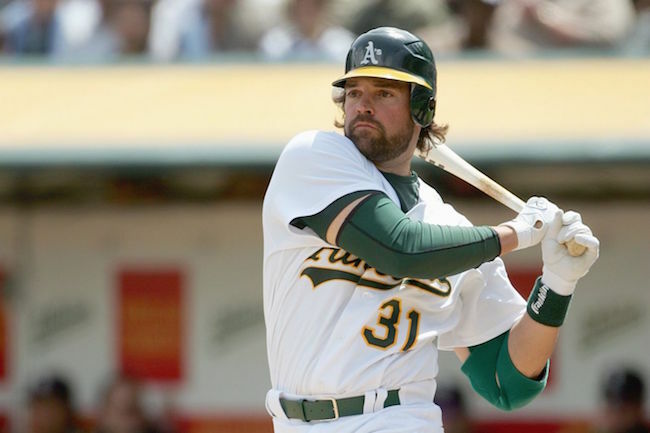 The next year, at age 38, he inked a one-year pact with the Oakland A’s, appearing in 83 games with eight home runs to go with a .275/.313/.414 line. He officially announced his retirement in May 2008. From family favor to Hall of Famer, Mike Piazza’s story of determination, inspiration, and success is one that deserves the same accolades and praise of his induction-ceremony teammate. Piazza has remarked that he will undoubtedly tear up during his Hall of Fame speech on Sunday. 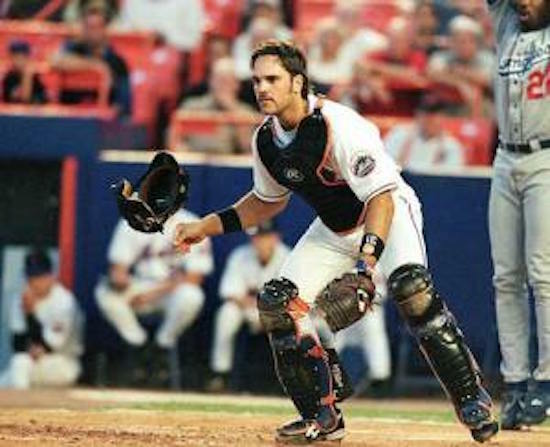 Despite a sub-par rep during his playing days, Piazza was a fine defensive catcher as well.